Hard drives and other removable media are likely to fail at some point, so printing photographs is probably the safest way of ensuring they don’t become a distant memory. For photographers who own a quality camera, A3-size printers are an ideal choice, but the reality is that many users don’t need to produce large prints regularly. If you want to produce great-looking photos and the occasional A3 print, the Epson XP 960 all-in-one unit could be the answer. It’s an A4 printer with a built-in scanner that also prints on A3 sized photo media. The XP-960 has a small footprint of 479x356x148mm, which is slightly larger than most A4 all-in-one units. Features include a motorized control panel and output tray, 10.9cm interactive LCD touchscreen, 4,800dpi scanner, duplex printing, Epson Connect, automatic Wi-Fi set-up and Wi-Fi direct connectivity, a memory card reader, PictBridge, and CD and DVD label printing. The XP-960 uses six Claria Photo HD dye-based colour inks A basic ‘Start Here’ guide sheet is supplied, which doesn’t go into great detail on setting up or on how to install the ink cartridges but rather gives information on how to load paper and use the control panel. However, once you insert the installation CD, an illustrated tutorial guides you through each step, including how to install the ink cartridges and connect to Wi-Fi, USB or network. The tutorial is one of the best I have seen. The installation process gives you the option to download the latest drivers from the Epson website (an internet connection is required for this) or you can unchecked the box and install the drivers that are included on the CD. You can either choose a quick install or select the software that you want, which includes Print CD/ DVD, Easy Photo Print, Easy Photo Scan, ArcSoft Scan-n-Stitch and E-Web Print. Finally, you will be prompted to print out a test page using plain paper, which confirms that the printer is set up correctly. The set-up process can take 15 minutes or longer. The Epson XP 960 uses separate cyan, magenta, yellow, black, light cyan and light magenta ink cartridges. The cyan, yellow and light magenta cartridges contain 4.6ml of ink, while the black, light cyan and magenta contain 5.1ml. Inks are also available in an XL size, which contains 8.7ml/9.8ml of ink. The printer uses two media cassettes. The small upper cassette holds up to 20 sheets of photo media (3.5x5in, 6x4in or 5x7in). The lower cassette holds up to 100 sheets of A4 plain paper or 20 sheets of photo media. Markings on the tray have media sizes from 3.5x5in to A4 and letter size. There is a tray extension for legal-size paper. Both trays are well built and feel robust. To print a single photo on heavyweight media, use the rear media slot. You can keep the main tray loaded with plain paper while using the rear slot. A removable CD/DVD tray is stored in the base of the lower cassette tray. 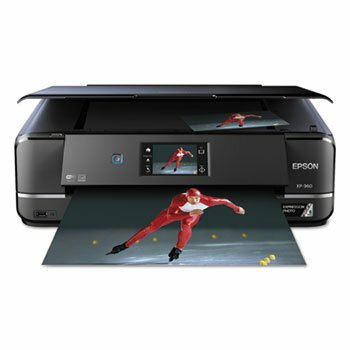 Connection to a computer can be via USB, Ethernet or Wi-Fi, and there is the option for remote printing via an Epson download of Email Print, Epson iPrint Mobile App (via Apple Store and Google Play), Scan to Cloud and Remote Print Driver. The printer can also be used as a standalone unit to print directly from a memory card or by scanning in a photo/ document. Before printing, the motorized control panel lifts and the output tray extends. When the printer is turned off, the output tray retracts and the control panel is lowered again. For the first test print, we put the AP test chart on an SD memory card and let the printer do a direct print using Epson Premium Glossy Photo Paper set to high quality. This took 69 seconds. The print quality is excellent, with just a touch of under-saturated colors but well within an acceptable tolerance. The print has a slight magenta cast, which disappears once the print has dried. Sending the file from Photoshop using the same settings, the A4 print also took 69 seconds and has an overall deeper color saturation. The portrait shows excellent skin tones. The gradient ramps display very smooth transitions from white to solid color, which is due to Epson’s Micro Piezo print heads with 180 nozzles per color and 1.5pl variable droplet size. The unique feature of the Epson XP 960 is in its ability to print A3-size prints (but not A3+). When printing at this size, the paper is loaded into the rear specialty media slot. A fl ap at the rear conceals this, and once opened, a two-stage telescopic media support can be pulled out. 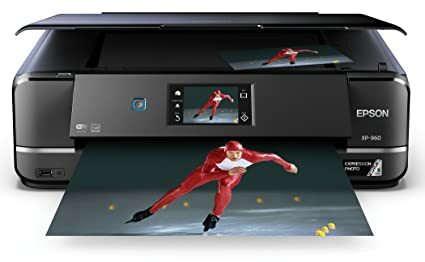 This printer differs from many others in that you send the print job to the printer and then wait for the LCD screen to instruct you to load the media. Once loaded, a press of the touchscreen starts the printing. The printer is very quiet and producing an A3 print takes 3 minutes 5 seconds. You can select borders or border less printing for all media sizes. Besides printing on A3 media, the rear specialty media feed can be used for single photos or heavier-weight A4 media. 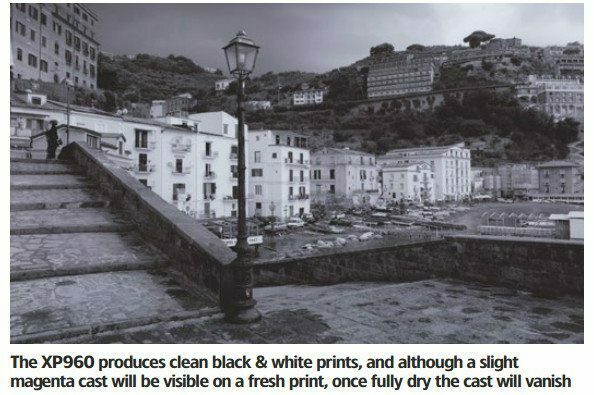 Black & white or grey scale printing is superb, considering this printer doesn’t have a dedicated set of grey inks. Greys are made up from a mixture of black and colored inks. With a good profile, the printer should produce a neutral grey. Many printers fail on this and often produce prints that have a magenta or cyan cast. Using the Epson XP 960 together with Epson Premium Glossy Photo Paper, the grey show no sign of a color cast. The glossy media displays a broad dynamic range from deep, solid blacks that still contain detail through to near white containing subtle details. Epson Matte Paper Heavyweight also produced a near perfect grey scale print. The matte media is a bit softer with the darker areas – detail was still present, but blacks don’t have the same punch. Matte media with this printer would be a good choice for portraiture and soft landscapes. The Epson XP 960 includes a CD/ DVD label-printing facility. The tray for this is stored under the main media tray. This has to be removed and loaded with an inkjet printable CD/DVD. The tray is then placed in above the output tray. The process is straightforward so long as the arrow markings are correctly aligned. Epson includes an application called Epson Print CD, which includes images and templates for creating labels. Inkjet-compatible CDs and DVDs must be used for this. The printer can be set to sleep mode after 3, 5, 10 or 15 minutes of inactivity or power off after 30 minutes, 1, 2, 4, 8 or 12 hours. For remote printing, ensure that the power option is set to off to prevent the printer from shutting down. All printing and other functions are controlled via an excellent touch-sensitive 10.9cm LCD screen. Images stored on a memory card can also be viewed on the screen prior to printing. Scanner The built-in flatbed scanner has a resolution of 4,800dpi, which is perhaps overkill for document and photo scanning. Normally, I would expect to find this resolution on a film scanner – and it’s a pity there isn’t a film scanning facility on this unit. The scanner lid has rear expendable hinges, which enable the lid to be raised for scanning thicker materials such as books. The Easy Photo Scan software enables you to determine where your scans are sent to: folder, email, Google photos, Facebook, Evernote or SugarSync, although it’s a pity that Twitter, Instagram and other social-media sites are not included. 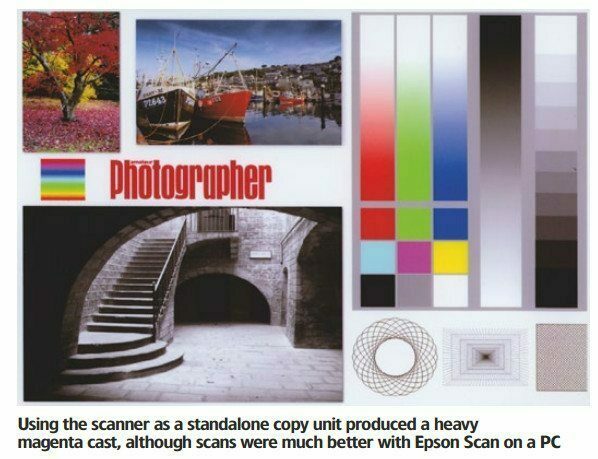 Easy Photo Scan launches the same Epson Scan software that is found on Epson’s dedicated flatbed scanners, and the modes include Full Auto Mode, Home Mode, Office Mode and Professional Mode. These cater for every level of user, with the Professional Mode giving you the greatest control of settings for photos. Scan speeds are exceptionally fast. The Epson XP 960 can be used as a standalone photocopy unit, without connection to a PC, which is convenient for quick document copying. Scans can be saved directly to a memory card, sent to a PC or printed. However, when using the scanner in the standalone mode for photos, our tests showed a color shift towards magenta, which was particularly noticeable in grey areas. Scans made via a PC using the Epson Scan software didn’t show the same problem. THE MARKET is awash with printers and all-in-ones at every price point, but what makes the Epson Expression Photo XP-960 stand out from others is that it is a well-constructed multifunction unit incorporating a useful A3 printing ability. The XP-960 performed faultlessly throughout this test and continually produced very high-quality photographic prints. Epson has produced an all-in-one worthy of serious consideration for keen photographers. Professional Photo Quality With SixColor Inks. Fold-Over Scan Lid Keeps Originals In Place. Stunning Borderless Photos Up To 11" X 17". Specialty Paper Support And Dvd Printing. Ultimate Wireless: Includes Wi-Fi Direct.